Axle weigh pads are high capacity weighing scales for weighing vehicles. Axle weigh pads are used to determine the individual axle weights and total gross weight of any type of vehicle. Axle weigh pads are typically used in pairs, with one pad for the left-hand wheels and one pad for the right. Axle weigh pads are most commonly used to determine whether a vehicle weight is within the legal limit for travelling on public roads. The V-TEK Pax AXLE WEIGHER Series of axle weigh pads are a low-cost Wired/Wireless Ultra Slim Weigh Pad, easy to install and calibrate, and low maintenance cost. Axle scales are designed to determine the Wheel, axle and Gross weights of the vehicles. System can weigh any type of vehicle regardless of its length or the number of axles. 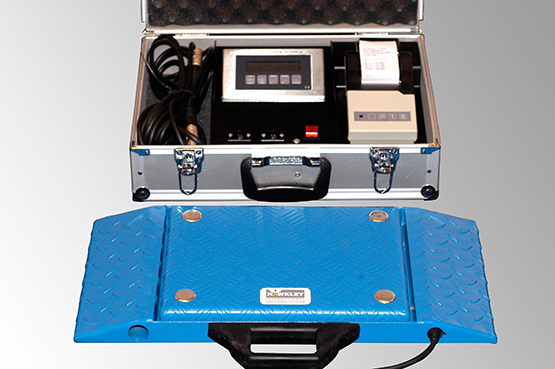 Cost effective and quick installation and calibration. Machined from light weight, high strength steel. Less space for installation and setup same day. 20/30 Ton per Axle capacity. Large display can be attached to the system on a need specific. Software with easy configuration and data handling, reporting and data transfer options. Rugged instrumentation to give seamless performance. Ultra-high frequency ensures better anti-electromagnet ability.